Aetiology Pulp death, apical periodontitis, proliferation of epithelial rests of Malassez, cystic change in epithelium; expansion of cyst by hydrostatic pressure; resorption of surrounding bone. Incidence 65-75% of jaw cysts. Periodontal cysts are the most common cause of chronic swellings of the jaws. • bony shell undergoing progressive resorption. 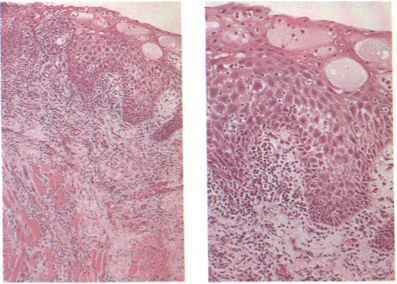 The epithelial lining is stratified squamous in type and very variable in thickness; sometimes with arcadcd configuration (Fig. 49), irregularly acanthotic (Fig. 50) or, rarely, very thick (Fig. 51). In some areas, the epithelial lining may be destroyed (Fig. 53, p. 28). 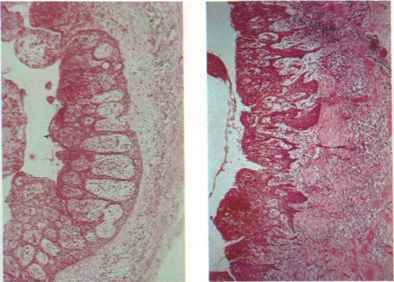 The underlying inflammatory infiltrate is also of variable density. The fibrous wall allows enucleation of the cyst from its bony shell. 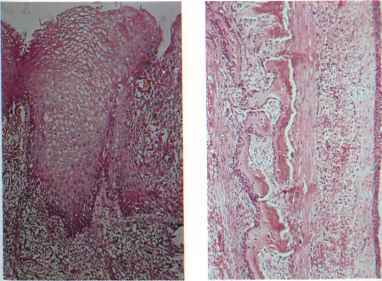 Bone shows progressive resorption on the inner aspect and apposition externally (Fig. 52), but resorption typically outpaces apposition so that the lateral wall is destroyed. Distension of cyst leads to thinning of the epithelial lining and, if infection is not superimposed, the inflammatory infiltrate becomes attenuated (Fig. 52). The causative tooth is extracted, leaving a residual cyst. They arc typically found late in life, and show latc-typc features. These arc rare and are occasionally related to a lateral root canal of a non-vital tooth. Others are developmental and form beside a vital tooth. Fig. 50 Inflamed cyst with irregular epithelial lining. Fig. 49 Arcaded epithelium of cyst lining. Fig. 52 Complete epithelial, fibrous and bony cyst wall. Fig. 51 Thick epithelium lining periodontal cyst.